Accommodation options abound throughout the Dominican Republic. 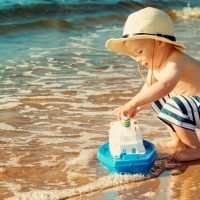 From beachfront resorts in Bavaro to upscale hotels in Punta Cana, families can easily find kid-friendly, all-inclusive resorts in the Dominican Republic that fit their budget and idea of the ultimate vacation. With ratings, family reviews and our own editors” first-hand experiences in mind, we”ve chosen our favorite all-inclusive resorts to help you decide where to stay on your next Dominican Republic vacation. 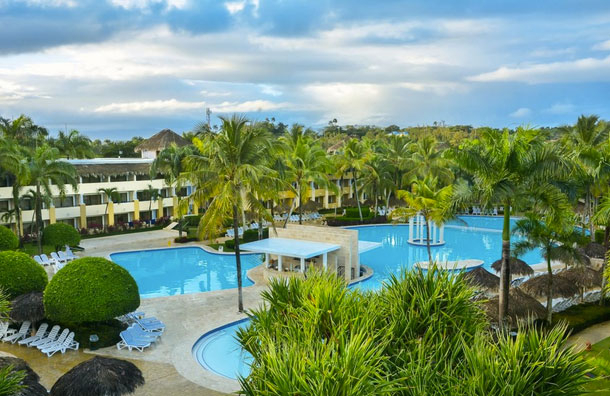 With eight outdoor pools, an adventure area for children with zip-lining and climbing walls, plus evening shows for adults and kids, families staying at the Melia Caribe Tropical in Punta Cana will find it easy to stay busy on vacation. This Punta Cana all-inclusive resort has more than 1,100 guestrooms and suites of all sizes, with mini-bars, private balconies and more. Family Junior Suites are better yet, with extra amenities like PlayStation consoles, baby kits, mini-fridges and bunk beds creating an inviting space for guests of all ages. The all-inclusive resort also boasts two buffet-style restaurants, 11 specialty a la carte eateries and 14 bars for adults to enjoy while kids are at the kids" and teens" club, open to children ages 8 months to 14 years. Families with teens rejoice: the all-inclusive Dreams Palm Beach Punta Cana has a Core Zone Teens Club for ages 13 to 17, open from 9 a.m. to midnight. While your teen plays games and makes new friends, parents can drop off young kids at the Explorer"s Club and head to a 5,400-square-foot spa that features more than 30 treatments. If kids want to join in on the pampering, there are services available for ages 6 to 16. The entire family can then relax by one of the pools or on the beach in one of the dozens of lounge chairs. When kids get hungry, stop at one of the seven onsite restaurants, or order room service to your tropical view guestroom and dine al fresco on your private, furnished balcony. We are big fans of Club Med, including Club Med Punta Cana. Head to the resort"s private beach and grab a drink or snack at the nearby bar when kids get hungry. The resort has three full-service restaurants, as well, plus an area specifically for parents who need to prepare food for infants. The resort continues to keep little ones in mind with Baby Club Med (ages 4 to 23 months), but it also caters well to the older kids. Petit Club Med, Mini Club Med and Passworld separate children ages 2 to 17 years into spaces with games and activities just for them. Be sure to visit the Circus School, where lessons in trapeze, juggling and tightrope walking are offered, or better yet, try Creactive by Cirque do Soleil. Launched in 2015, the program allows guests to learn the techniques of all circus acts -- aerialists, acrobats, jugglers, high bungee jumpers and even musicians. Family suites, babysitting services (until 1 a.m.) and multiple pools (including one just for kids) round out our favorite aspects of this all-inclusive resort. The Reserve at Paradisus Palma Real is a resort within a resort in Punta Cana. The larger Paradisus resort created this smaller boutique property with families specifically in mind. The Kids Zone, for ages 1 to 12, offers cribs for little ones, an adventure park with a climbing wall and bounce castle and evening karaoke, magic and puppet shows just for them. Additionally, families receive their own private concierge to utilize during their stay when they book one of the 80 Family Concierge Suites. 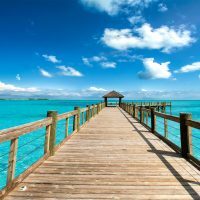 With a special check-in area, Kids Kits upon arrival, connecting rooms, turn down service with snacks, 24-hour room service, in-room video game consoles and more upon request, families are really treated to paradise at this all-inclusive resort. Located along the Caribbean Sea, the all-inclusive Now Larimar Punta Cana offers upscale accommodations with family-friendly features. Deluxe Family Rooms have space for up to three adults and three children (or four adults and two children), with private balconies and two bathrooms. At the Explorer"s Club, kids ages 3 to 12 will enjoy arts and crafts, treasure hunts, video games, water play areas and more, with activities offered until 9:30 p.m. so parents can enjoy a romantic dinner at one of nine restaurants. For teens ages 13 to 17, the Core Zone club is full of fun just for them, from Ping Pong, basketball and table games to a snack bar with non-alcoholic drinks and weekly bonfires on the beach. 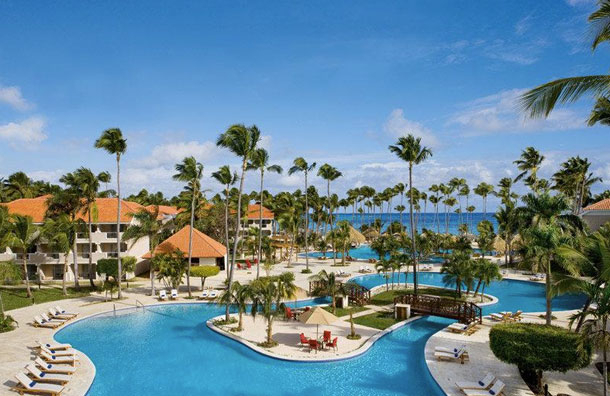 With suites that can sleep up to 10, large and multi-generational families will find the all-inclusive Hard Rock Hotel & Casino Punta Cana an easy choice for vacation. Plus, the expansive resort features 12 pools -- one with a kids" waterslide - a mini-golf course, the Arcade Center with games for teens, the Extreme Center with a rock climbing wall and the Little Big Club, where little ones can sing songs and play with their favorite characters, such as Barney, Bob the Builder, Thomas the Tank Engine and more. And while the kids are busy, parents can get their own game on at the casino, with its 45,000 square feet of tables and slots. The entire family can regroup for dinner at one of the nine restaurants at the resort, topping off the evening at Ice Cone, where fresh ice cream treats are made right onsite. 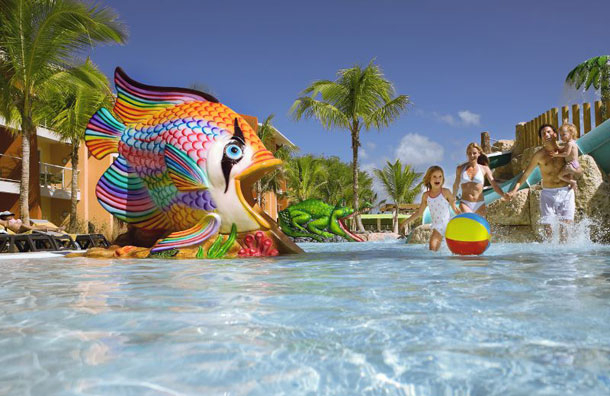 At the all-inclusive Barcelo Bavaro Palace, families receive special treatment. The Family Club features three levels of accommodations for parents and children, with mini-bars stocked with milk, juice, cereal and snacks, kids" beach kits with essentials for time on the sand and free admission for each person to the onsite Pirates Islands Water Park. Additionally, the resort includes 11 restaurants; four pools, including one just for kids; the Barcy Water Park, which is included with all-inclusive rates; a nighttime nursery open from 6 p.m. to midnight; and a special nightclub just for teens. Located on the tropical beach of Arena Gorda in Punta Cana, the all-inclusive Hotel Riu Palace Bavaro is as luxurious as it is kid-friendly. Room service is offered 24 hours a day in all suites; children ages 4 to 12 have their own club for arts and crafts, games and more; water sports, like windsurfing, kayaking and snorkeling are offered; and Wi-Fi is free throughout the entire resort (though we bet you won"t want to be connected to devices on this vacation). Children have their own pool, parents have their own spa and nightly entertainment, and the entire family will enjoy the five restaurants, plus the patisserie and ice cream parlor. Punta Cana resorts don't cut any corners -- especially this one! Whether your teen wants to go scuba diving or just hang out with new friends, or your little one wants to splash in his or her own pool or make arts and crafts, all of the kids will be entertained at the all-inclusive IBEROSTAR Costa Dorada. Located just 10 minutes from the city of Puerto Plata on the Dominican Republic"s northern coast, the resort features guestrooms and suites with private balconies, direct beach access, a separate children"s pool and water play area, a teen club for ages 13 to 17 and six restaurants and snack stands. Plus, parents can enjoy the onsite spa with its steam rooms and Turkish baths, as well as dancing, live music and a variety of shows just for them. 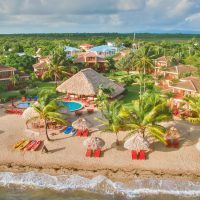 Located on the southeast coast of the Dominican Republic, in the beachfront village of Bayahibe, the IBEROSTAR Hacienda Dominicus resort is a great option for families looking for a relaxing atmosphere. Join the kids by one of the four resort pools, one of which is just for children with zero-entry, and watch (or join!) as tweens and teens ages 12 and older take a free, introductory scuba diving course in one of the larger pools. Kids ages 4 to 12 can also beat the heat by joining in on the activities offered just for them at the Lucy Kids Club. Dine at one of the nine restaurants and bars throughout the day, and then return to one of the 504 guestrooms and suites, all of which feature private balconies, complimentary mini-bars and 24-hour room service. For large or multi-generational families, connecting rooms are also available.